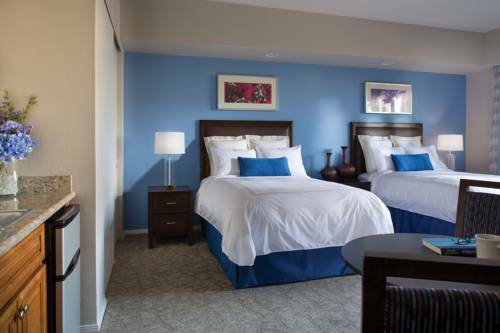 Make yourself at home in Marriott's Desert Springs Villas I. Our premium vacation ownership resort showcases family-friendly amenities and a prime location on 400 acres in the beautiful Coachella Valley, moments from Palm Springs. Choose between guest rooms and condo-style one- and two-bedroom villa rentals; guest rooms feature kitchenettes and double beds, while villas include fully equipped kitchens, washer/dryers and master suites with king beds and oversized soaking tubs. All of our accommodations offer complimentary Wi-Fi and spacious balconies. Take a dip in one of seven resort pools, enjoy an al fresco bite at The Water's Edge Pool Bar & Grill or break a sweat in the fitness center. Kids of all ages can have fun at The Shade, our on-site recreation center; other resort activities include clubTHRIVE, table tennis and bike rentals. If you're in the mood to explore, The Living Desert Zoo and Gardens and Wet 'N' Wild Palm Springs are close by. An unforgettable vacation awaits you here! The Water's Edge Bar & Grill: Settle in at The Water's Edge Pool Bar & Grill and enjoy classic American dining as you soak up the Palm Desert sunshine. Our poolside restaurant features burgers, salads, cool drinks and a vibrant atmosphere that the entire family will enjoy. The Marketplace: Stop by The Marketplace and pick up a snack, a drink, Starbucks coffee and other necessities. It's the perfect spot for those on the go in Palm Desert.